South East CBD areas not connected. 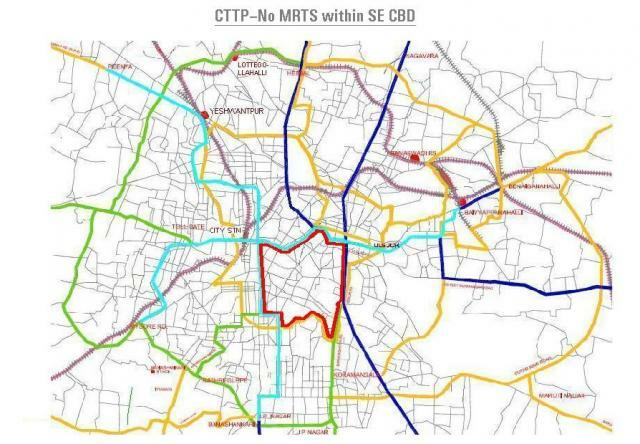 The attached Sketch “CTTP–No MRTS within SE CBD” indicates that the very large area marked by a red outline – the South-Eastern quadrant of the inner core area within CRR that has important CBD points such as JC Rd (105,000 PCUs), KH Rd (96,000 PCUs), Lalbagh Rd (61,000 PCUs), Corporation /Hudson Circle & Richmond Circle does not have convenient Mass transit within easy reach. Very large nos. of commuters travel to activity centers around these areas daily & school going children /staff to various schools & offices arriving by private vehicles choke up Richmond /Residency roads during school times. The only TTMC at Shantinagar may not attract these commuters due to the inconvenience of long distances, transfer to buses & the time delay involved. 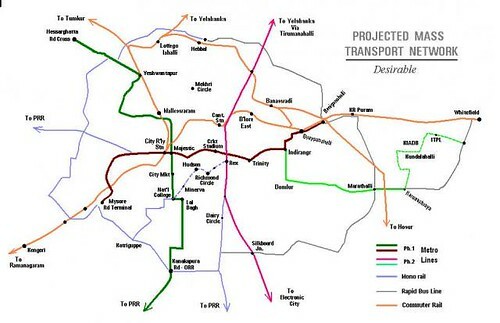 A possible way to address this problem is to extend the Monorail /Light rail route (Kathriguppe to National College) past National college to pass through Sajjan-Rao circle, Minerva, JC road, Corporation, Hudson circle, RRM road, Richmond circle & Residency road to terminate at Rex cinema & have an interchange with the proposed NE–SE Metro route (Phase-2). This routing had been proposed earlier for ELRTS, which had since been abandoned. At sometime in the future, loads may become heavy during peak hours on the E–W line as it is the only line planned to connect the two N–S lines & the extension will also provide another much needed connection between the two N–S lines through the core area. Very useful information on the site 'citytransport.info', thanks. http://www.citytransport.info/ is a very good site about various options of city transport in various countries. Just wanted to share with you all. Unfortunately, it had not been suggested before CTTP was finalised. However, it was pointed out to BMRC thro' an RTI that had been filed earlier, but they had responded stating that Urban Development Dept (UDD) was responsible for such matters & that BMRC was only the builder /operator of the Metro system. BANGALORE: The Karnataka High Court on Tuesday stayed for two months the acquisition of land by the State for the construction of a Bangalore Metro Railway Station at Trinity Circle at the junction of M.G. Road and Richmond Road. Justice Ashok B. Hinchigeri passed the order on a petition by M.V. Muralidhar, Badarinarayana Kakani and Sadat Ali Khan. The petitioners had challenged the acquisition of their lands under the Karnataka Industrial Areas Development (KIAD) Act by the KIADB. They said on January 23, 2006, the KIADB issued a notification seeking to acquire their lands for the metro project. Though they filed objections on February 24, 2006, the final notification acquiring their land was issued on October 24, 2007. Challenging the acquisition, they said the plan for the metro line on M.G. Road was unscientific. They said there were other suitable sites for a railway station but the State had not given a thought to them. The petitioners urged the court to stay their dispossession and also stay the acquisition process. In his interim order, Justice Hinchigeri stayed for two months the acquisition of the properties of the petitioners and adjourned further hearing on the case. The same judge had earlier stayed the acquisition of land in Criag Layout for the construction of a metro railway station. Has this suggestion be shared ? This is a wonderful and thoughtful suggestion. Has this been shared with the authorities during the feedback sessions or when they asked for citizen input on CTTP ? 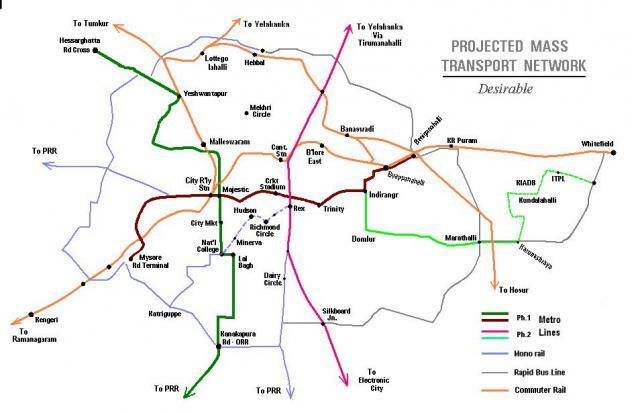 As per CTTP, there is a BRT corridor recommended from Hosur road to Domlur, via Koramangala 100-ft rd & inner ring road. If this is done, there may be no need for a guided rail along the same route. This BRT will have an interchange with the EC - Yelahanka Metro route (phase-2), which goes past forum mall. 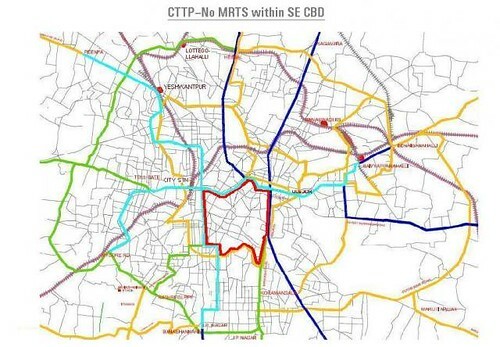 Also, the other phase-2 route shown is via Indiranagar 100-ft rd to interface with the phase-1 route (as per CTTP) at CMH rd. 2nd phase metro starts from Trinity Circle going towards Marathalli. In the map it is shown to start from CMH road. I was also thinking on the same lines of using Mono to extend further and not just work as a feeder to Metro. The extension of Katrigguppe - National College link is a very much necessity. Need for a guided system on the JC Road, which is the southern Bangalore's main connecting road is a main necessity. Also, I was considering the extension of Bannerghatta Road towards forum and then onto Koramangala Inner Ring Road, reach Domlur Circle and proceed further to meet the Metro Link at CMH Road.